New River Gorge cabins and lodges are among the sought-after accommodations in West Virginia, as a result of their proximity to the and New River Gorge National River. Found throughout much of the New River region, most are open year-round and include amenities such as hot tubs, garden areas, and access to recreation centers. 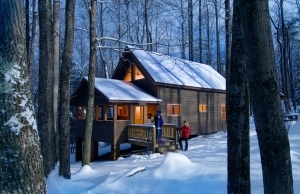 Winterplace ski area is a notable attraction for cabin visitors in winter. Pending completion of our directory of West Virginia cabins, listings are provided for the following cities and towns in the New River Gorge Region in southern West Virginia: Ansted, Athens, Beaver, Beckley, Bradley, Daniels, Coal City, Crab Orchard, Fayetteville, Ghent, Hinton, Mabscott, MacArthur, Mount Hope, Oak Hill, Thurmond, Summersville, Stanaford, Piney View, Princeton, Prosperity, Shady Spring, Sophia. Help build our guide to lodges and cabins in the New River Gorge region. As you encounter cabins, lodges, and vacation rentals that aren’t listed in our lodging directory, please let the proprietor know of the opportunity to be listed here.